Recommendation: Use weigh scale whenever possible as OEM info usually differs from actual. DISCLAIMER: The calculations in this document have NOT been engineered nor reviewed/approved by a professional engineer. The calculations and information provided may contain errors and MUST NOT BE USED without reference to manufacturers published specifications. Although this calculator is in the public domain, no guarantee is expressed or implied that it will serve the purpose the user intended. By Clicking the "Calculate Results" button, you acknowledge that you have read and understand this disclaimer. 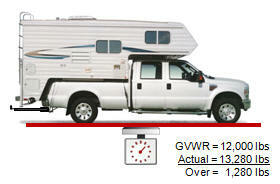 Need to estimate your truck & camper weight??? Questions or Comments about this calculator?? Tire load rating can be found on tire sidewall. Tire maximum loading will be lower when tires are used in DRW configuration. Receiver Ratings are typically marked on receiver. Gross vehicle weight rating. The value specified by the manufacturer as the maximum allowable loaded weight of the vehicle. Gross combination weight rating. The value specified by the manufacturer as the maximum allowable loaded weight of the truck, camper and trailer. May be governed by State or Provincial Regulation. Can be found stamped or on a label on the receiver. 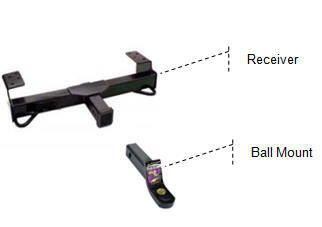 Ensure that the ball mount has the same rating as the receiver. The value specified by the manufacturer as the maximum allowable trailer weight that can be attached to the hitch receiver. Includes both the weight on the trailer axles and the tongue weight. 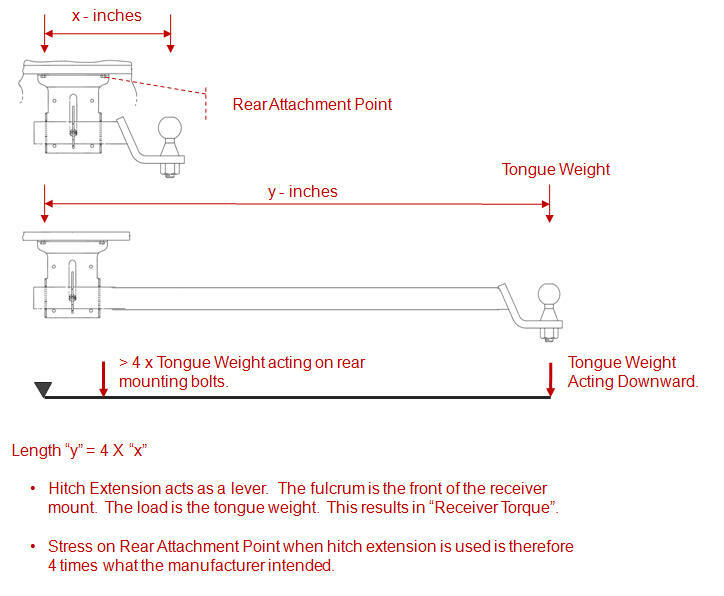 The torque (rotating force) applied to the hitch receiver by the hitch extension. The torque increases proportionally with the length of the extension. Typically, the manufacturer will not publish torque limits, but may provide ratings with extensions of specific lengths. 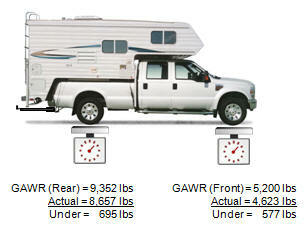 This calculation can be ignored if the manufacturer specifies a rating with a hitch extension. Torklift Superhitch provides ratings with their extensions. Torque can be significantly reduced through the use of a weight distribution (equalizer) hitch. A weight distribution hitch MUST be used any time the torque exceeds 100% of design. Exceeding the reduced capacity limits can result in bending the extension, failure of the receiver mounts due to increased torque and may cause the trailer to be disconnected from the truck causing a significant risk to yourself, your family and the general public. Note: Does not apply to Torklift Superhitch or Reese Titan receivers. Offered for information only. Always refer to OEM recommendations, specifications and limits. 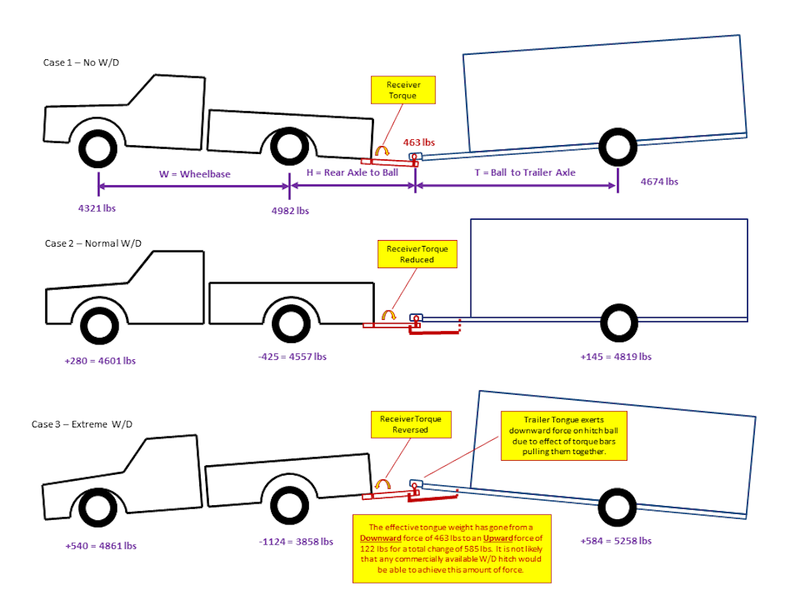 How a weight distribution Hitch affects axle weights. With no weight distribution hitch (Case 1), the hitch extension will act as a lever, adding weight to the rear axle and removing weight from the front steer axle. By using a weight distribution hitch (Case 2), the torque bars on the hitch will reduce the applied leverage, moving weight from the rear axle back to the front steer axle and trailer axles. The effect is to reduce the tongue weight. 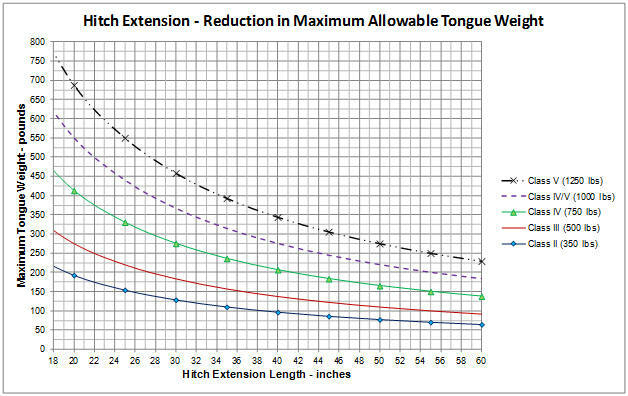 Tightening the torque bars has the effect of reducing the tongue weight effect further and if they are strong enough, may reduce the tongue weight to zero or even slightly negative. Note: This is for illustration only and is not recommended. As the rig travel over a bump, curb or pothole, the rear of the truck will bounce downward increasing the loading on the torque bars. This momentary increase in torque bar loading will reduce the forces applied to the extension and receiver. It is STRONGLY recommended to use a weight distribution hitch whenever a hitch extension is used. This does not typically apply to towing a car "4 wheels down" as the loading on the hitch is minimal.